The move to Windows 10 is inevitable, but with so much to take into account during a migration the transition isn’t always a walk in the park. 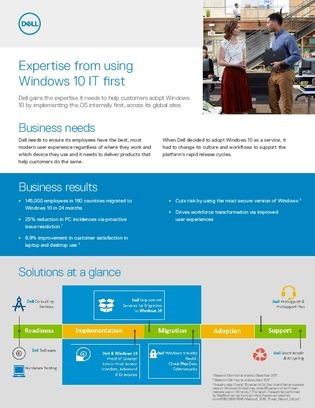 Luckily, Dell has developed OS Migration Consulting for Windows 10 with a portfolio of services, which include a complimentary whiteboard session, and a variety of deployment options. Don’t wait until it’s too late to get help making your Windows 10 transition as smooth and risk-adverse as possible. Download this resource to learn how Windows 10 services can help your organization throughout the process.